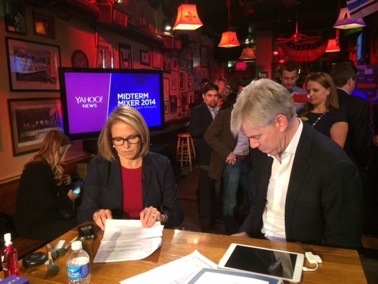 Yahoo News is hosted a post-election livestream led by Yahoo Global News Anchor Katie Couric. The Midterm Mixer was streamed live on Yahoo.com from Washington, D.C.’s Capitol Lounge bar. The program started at 11pm and lasted until past midnight. In front of an audience, Katie was joined by David Gregory, renowned Washington journalist and former moderator of "Meet the Press"; Grover Norquist; Politico’s Mike Allen; Center for American Progress president Neera Tanden; Democratic strategist Jamal Simmons; Republican strategist Leslie Sanchez; David Swerdlick from the Root; and members of Yahoo News, including political columnist Matt Bai, Chief Investigative Correspondent Michael Isikoff, White House Correspondent Olivier Knox and News and Finance Anchor Bianna Golodryga. The Georgetown Chimes, Georgetown University’s a cappella group, was on hand for musical entertainment. One of the two bars was reserved for the event. Five cameras, including one on a jib arm and another on a Steadicam, along with the crew were working in the “intimate” space. Alt Gobo’s Peter Roof provided expert support, along with grunt support, to the production’s technical manager.